Ah, this is a beautiful image and reminds me of my Grandpa who was a horseman on a farm in Wiltshire. Robert Weir Allan was born in Glasgow, and studied art both there and in Paris before settling in London. He toured the world, visiting countries such as Egypt, India and Japan, and his watercolours of far-off places can be seen in many auction catalogues. This picture is housed in North Lanarkshire Museum who carry many images of traditional industries of Scotland together with social history. I adore the purity of the colour in this work, clear and crisp. The white, green and blue are wonderfully striking, and it is a unexpectedly positive image of rural life, as opposed to the Clausen I posted a couple of days back. This chap and his shire horses are getting on with their work on a sparklingly good day and despite it being winter, he has had to roll his sleeves up. You get a sense that all is well in his world. 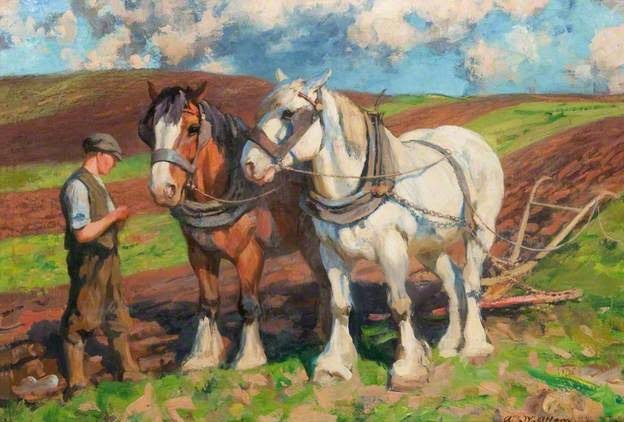 He has two fine looking horses, a good plough and a clear sky. It makes a lovely change to see a rural picture where you don't suspect that everyone will starve the moment you take your eye off them. That's the kind of spirit we need approaching Christmas and the cold months ahead. Good-o. My recommendation for pressie today is one of the best books I read this year. 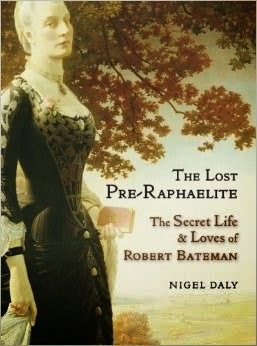 The Lost Pre-Raphaelite is a wonderful story told in an engaging way and Nigel Daly is easily the most delightful storyteller you'll ever spend time with. It is a combination of a biography of Bateman coupled with the adventure Nigel went on to uncover the complicated and heartbreaking truth behind a lesser known Pre-Raphaelite artist. Read it and enjoy! My review of this marvellous book is here, together with links to buy it. I also lives there for 2 years to be close by, so the book was of interest in more ways than one thought Nigel's writing was excellent. Have you ever seen Winter's White Silence by Lucy Kemp-Welch? Yes, I have, thanks to the PCF catalogue on the BBC. LKW does a lovely horse!